However, since Della Corte’s attribution seems to be based on a single dipinto (CIL IV 251) supporting Pansa’s election as aedile found near the entrance of the house, this is somewhat dubious. The house is also believed to have been owned by Gnaeus Alleius Nigidius Maius, and bears a dipinto naming Marcus Cerrinius Vatia (CIL IV 253), so like many of Della Corte’s suggestions, occupancy cannot be determined with any certainty. What is known from the evidence is that a Gaius Cuspius Pansa did run for the office of aedile in the last years of Pompeii, appearing in at least fifty dipinti (AE 1951: 157d, CIL IV 97, 117, 275 = ILS 6419e, 385, 438, 509, 542, 559, 562, 566, 572, 579, 610, 619, 622, 702 = ILS 6419a, 708, 710, 785, 855, 869, 871, 960, 1006, 1011 = ILS 6419f, 1046 = 7181, 1068 = ILS 6437, 1153, 1172, 2972, 7129a, 7179, 7201 = CLE 2053, 7220, 7242, 7257, 7289, 7320, 7404, 7435, 7445, 7518, 7601, 7630, 7686a, 7742, 7743, 7777 = AE 1937: 127, 7850, 7875, 7919 = AE 1913: 15, 7955, 7963). This man, since he is running for the lowest magisterial position in the local cursus honorum, is not only the last member of the family, but is also likely not the reason the name of Gaius Cuspius Pansa is so ubiquitous in the epigraphic evidence of the city. [— Cu]spi(um) / [——] // L(ucium) Septum(ium) / d(uum)v(irum). [—?] Cuspius T(iti) f(ilius) M(arcus) Loreiu[s] M(arci) f(ilius) / duovir(i) [d(e)] d(ecurionum) s(ententia) murum [e]t / plumam fac(iundum) coer(averunt) eidemq(ue) pro(baverunt). 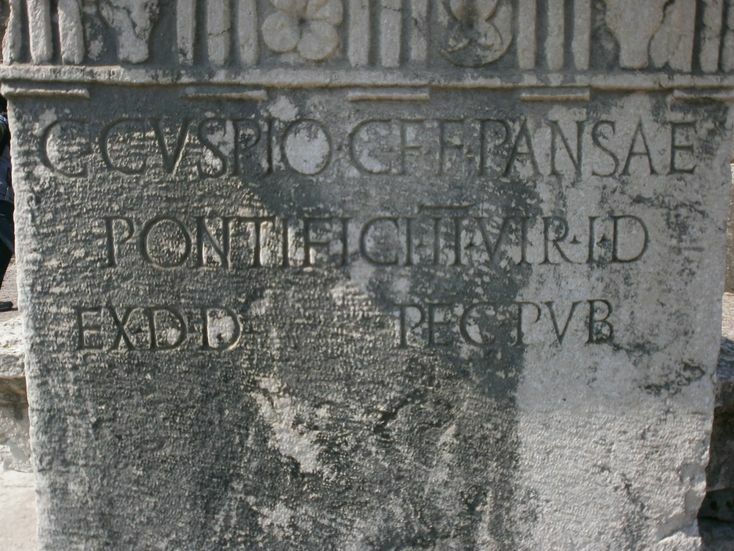 One of his posts, as a quattroviri, is significant as it is one of the only extant inscriptions which name this office, which is often believed to be one of the earliest magistracies in the colonial period of Pompeii. [—] Cuspius T(iti) f(ilius) M(arcus) Loreius M(arci) f(ilius) / IIIIvir(i) L(ucius) Sept<u>mius L(uci) f(ilius) / D(ecimus) Claudius D(ecimi) f(ilius) IIIIvir(i) ex / pe<c>unia publica d(e) d(ecurionum) / s(ententia) f(aciundum) curaverunt. The remainder of the epigraphic evidence for the family actually reveals that there were (at least) three men in the family named Gaius Cuspius Pansa – the aedile of The Last Days of Pompeii – and two others, all of whom were politically active in the city. There are two electoral dipinti (CIL IV 3605 and 7913) which name a Cuspius Pansa running for duovir, which likely belong the second of these eponymous men. There are a set of four monumental inscriptions – two from the amphitheatre and two from the Forum – which inform us of the success of these men. C(aius) Cuspius C(ai) f(ilius) Pansa pater d(uum)v(ir) i(ure) d(icundo) / IIII quinq(uennalis) praef(ectus) i(ure) d(icundo) ex d(ecreto) d(ecurionum) lege Petron(ia). C(aius) Cuspius C(ai) f(ilii) f(ilius) Pansa pontif(ex) / d(uum)vir i(ure) d(icundo). These inscriptions were found at the base of two niches, opposite each other, in the east and west walls of the northern entrance to the amphitheatre. The most likely scenario is that father and son paid for restoration work to the arena after the earthquake of AD 62, and whilst there is no specific evidence tying these men to such activities, there is archaeological evidence for structural reinforcement of the spectacula in the post-earthquake period. C(aio) Cuspio C(ai) f(ilio) Pansae / IIvir(o) i(ure) d(icundo) quart(um) quinq(uennali) / ex d(ecreto) d(ecurionum) pec(unia) pub(lica). C(aio) Cuspio C(ai) f(ilii) f(ilio) Pansae / pontifici IIvir(o) i(ure) d(icundo) / ex d(ecreto) d(ecurionum) pec(unia) pub(lica). Based on the offices held by father and son, their apparent involvement in post-earthquake reconstruction, and the campaign for aedile being waged by the third iteration of the family name in the late 70s, the political careers of three men have been dated approximately as AD 20-40 for Gaius Cuspius Pansa I, 50-60 for II, and 79 for III. This dominance of Pompeian politics by one family for fifty years or more is, despite the general belief that a small number of families were continuously controlling small town politics, actually surprisingly rare in the epigraphic evidence. The fact that all three men bore the same name may have contributed both to their success in office as well as to the preservation of so many texts recording their activities.